A re-furbished 2017 Toyota Corolla has given to Haley Proctor; a soon-to-be single mom and hospital corpsman with the U.S. Navy, based at Camp Pendleton. 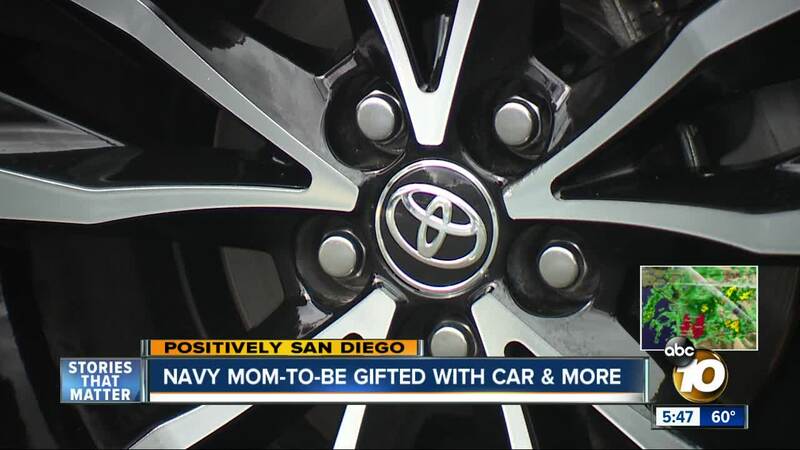 SAN DIEGO (KGTV) — Christmas came early for Haley Proctor; a soon-to-be single mom and hospital corpsman with the U.S. Navy, based at Camp Pendleton. "Thank you so much. I appreciate it!" Proctor exclaimed as she received a re-furbished 2017 Toyota Corolla. Before she arrived, the Corolla was loaded with items from a simple wish list: Diapers, baby clothes, a stroller, a car seat, and a teddy bear in a blue vest. All are the same color as the car. "Drive back & forth to work and take my daughter to daycare and go to the grocery store and things I was doing on foot," she said. "They did. They did it in blue; it's my favorite color. So awesome." A small town girl from Indiana, where it's snowing now, Haley was grateful on many levels. The Armed Services YMCA, Caliber Collision, and Allstate Insurance weren't finished; presenting her with a check for $1300 dollars. "It's gonna make my life 2,000 times better!" she added. "So overwhelmed I can't even cry. Thank you so much. Such a blessing." One other blessing coming in about four months, "I think I'm gonna name her Gabriella. She's a blessing and this whole team's been a blessing to me. I am so appreciative and I hope that one day I can give back to someone that done something good." It is an early Christmas gift for Haley and a birthday present, too. She'll celebrate both on Dec. 25.